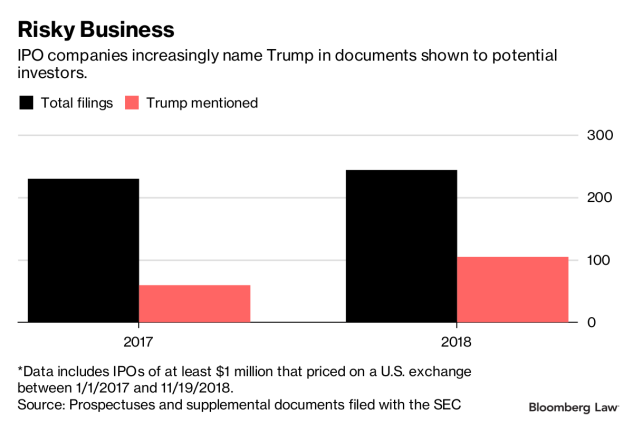 IPO-bound companies increasingly cite President Donald Trump and his administration as a potential risk to their business. As of Nov. 19, 43 percent of companies that priced an initial public offering of $1 million or more this year mentioned Trump and his administration’s policies in their prospectuses or supplemental documents, a Bloomberg Law analysis of corporate filings shows. That’s up from 26 percent in 2017, when 59 of 230 IPO companies named the president in their investment pitches. The uptick could signal that businesses increasingly feel the need to hedge for the uncertainty resulting from the president’s market-moving statements and actions of his administration. A bulk of the references covered Trump-backed proposals to alter health care policy, as well as his administration’s testy trade relationship with China and other countries. The president’s support of tax reform legislation, which he signed into law last December, and the accompanying accounting changes also appeared in several offering documents. Most mentions came in the risk factors section — used to outline circumstances or events that could adversely affect business operations — of prospectuses and related filings that are required by the Securities and Exchange Commission before completing an offering. Multiple companies counted more than one of the president’s decisions, or his administration’s activity, as potential risks. Arco Platform Ltd., a U.S.-listed educational software provider based in Sao Paulo, Bazil, named Trump in its Sept. 27 prospectus filing as a risk to both its share price and the overall Brazilian economy. “We have no control over and cannot predict the effect of Donald Trump’s administration or policies,” the document said. Restoration Robotics Inc., in the final version of its prospectus, cited the regulatory risks posed by a Trump executive order that placed new rulemaking requirements on federal agencies aimed at eliminating some existing rules. The company said there could be a negative business impact if the new policies hamper the Food and Drug Administration’s ability to issue guidance and approve companies’ marketing proposals. Risk disclosures serve as legal protection against lawsuits claiming that omissions or misstatements in offering documents harmed stockholders. They’re “meant to give investors some idea about things that could go wrong,” Pritchard said. President Barack Obama’s appearances in IPO filings during his first two years in office were less frequent. About 24 percent of 78 companies that priced IPOs of at least $1 million in 2009 — in the midst of the financial crisis — mentioned him in their filings. The number dipped to 14 percent the following year, when just 27 of 197 companies referenced Obama’s policies or his administration’s actions, filings show. Obama’s mentions may be lower than Trump’s, but companies still likely referenced Obama’s policies frequently in their filings during the late 2000s, Pritchard said. Political factors are frequently included in corporate risk disclosures, although, more often than not, they take the form of company-specific regulatory issues. A pharmaceutical company, for example, may cite the risk of failing to gain government approval of a new drug. The increased appearance of Trump in these filings suggests that trend might be shifting. There can be added pressure when crafting the risk factors in a prospectus than those in a quarterly or annual filing. Companies often face more scrutiny and liability at the time of an IPO. Citing an individual, while unusual, wouldn’t be “crazy” if a company thought that person was likely to have a regulatory impact on its business, Pritchard said. The fear of leaving out a risk factor that others are including might also be driving the uptick in mentions of Trump in IPO filings.